Management: guild leaders can create, delete, and promote guild ranks. Guilds can have up to ten ranks of membership, each of which can have its own icon. Bank: guild leaders can set permissions to allow members to withdraw gold from the guild bank based on their rank. Store updates: anyone in your alliance can browse your guild store in Cyrodiil if your guild owns a keep. Traders: The Gold Coast Trading Company will establish kiosks throughout the cities of Tamriel. The merchants running the kiosks can be hired by guilds on a weekly basis (via auction) to act as a portal to their guild’s store, which can be browsed by any player in the guild’s alliance. Auctions use a blind bidding process and are held once a week per merchant. Heraldry: guild leaders can design guild heraldry for their guilds if they have 10 or more members. Each guild member can purchase and wear a tabard emblazoned with the guild’s chosen colors and crest. There are 250 colors, 63 backgrounds, and 136 crests that can be mixed and matched to form guild heraldry. New armor sets that are visually distinct from others. A new system that makes it easier to find complete sets in-game. Item rewards will be handed out in a more logical fashion by quests and enemy drops. Update 3 will be on the PTS soon, bringing with it a lot of fun new character and guild customization features. 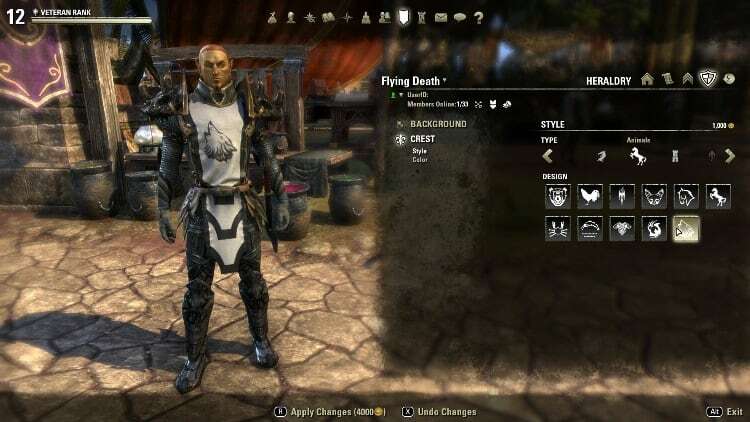 This update has been in internal testing at ZOS for many weeks now, and as part of that effort, we had a studio-wide contest to see who could use the new dye system to come up with the coolest (or most horrendous?) outfit. Check out some of the screenshots from the contest—it was a lot of fun, and it shows the lengths to which you can change what your character looks like just by applying different colors. We’re getting closer and closer to being able to announce a specific date for the migration of the EU Megaserver to our Frankfurt data center. As I type this, it looks like the move will happen during either the last week of July or the first week of August. This is obviously a delicate operation, and we have to make sure that everything is up and running and that all character data is transferred successfully. We are taking the time to do it right. Phase 1: Make sure the difficulty in Veteran zones ramps up slowly and rarely exceeds what a good player can do on their own. This change came to the live servers on July 7th. By the time you read this, you should be able to play Veteran content the same way you played from 1-50. Phase 2: Remove the Veteran Points system and have normal experience gains direct the growth of the Veteran System. Also, we’ll increase the amount of XP granted in PvP. This will happen at some point over the summer as we transition to the new system. Phase 3: Introduce a completely new Veteran System based on new character customization and growth mechanics. We’ll talk more about this in the near future—especially during Quakecon—but for now, be aware that we’re going to make some much-needed changes to post-50 PvE gameplay. The primary reason for making these changes is to ensure that you have meaningful choices in the post-50 PvE game experience that reinforce the design idea that you can play the way you want to play. The survivability of werewolves and the balance between their strengths and weaknesses may receive some adjustments. The effectiveness of Templars is being evaluated, particularly some specific builds that may be underperforming when compared to similar builds for other classes. Our previous changes to the Dragonknight class are undergoing review to ensure that the class is fun to play and still feels powerful. We’re continuing to make adjustments to the Nightblade. We believe that what we’ve done so far has helped, but there may be more on the way. We’ve been working steadily behind the scenes to make combat more fun and visceral. This is a multi-pronged effort to tweak and fix dozens of different game systems to lead to a smoother, more responsive combat system. Similar to how we’re changing the Veteran System, we’ll make meaningful changes over time. We’re making changes to animations, audio, timing, server network optimization, and other factors to make combat more engaging. We’ll show off some of these new combat enhancements at QuakeCon to demonstrate the evolution the combat system has made over the last few months. Good to see that guilds are being given a boost, even if it’s basically of the fluff variety. Nice chance to involve our Luxers in helping choose design and colour for the new tabards. Also interesting that they appear to be moving towards an auction house, one step at a time. Ongoing re-balancing of classes very welcome, as is the resiting of the EU megaserver. Can’t comment personally on the Veteran ranks changes yet, but as ever I’m sure there will be two completely opposed points of view. Thanks for the information Aydin. What they really need to do, is to raise upscaling in Cyrodiil to VR5 (at the moment its upscaling you to LVL50). Otherwise those ppl who not yet reach VR5 will be seriously underpowered. Nice update with a good balance of fluff and content.